The 2011 Caloundra Music Festival ( Oct 7 – 9 ) is over for another year BUT the busking action in Caloundra ( ClownTown ) and other places on the Sunshine Coast continues all year round. There were 30 entries competing for $1500 prize money in the inaugural Bulcock Busking Festival held in conjunction with the CMF and they were all of the musical variety. It would be great to see provision for circle acts such as jugglers, magicians, acrobats and comedians next year. Some of the buskers held street performance permits issued by the Sunshine Coast Regional Council. Other buskers were issued a 3 day casual permit. Thanks to the organisers and sponsors who were blessed with mixed weather and did a good job promoting and running the event. The buskers I met during the event varied from weird to wonderful. About half of the buskers were teens with parents and friends recruited to hand out the voting forms. My name is Captain Tricko and as a full time street performer myself I entered the competition not so much to win but to meet, film and fraternise with the other buskers. So this blog is my comment on that experience. First it stands to reason that a busking contest held without an audition process delivers some tuneless busking, some first timers and of course the street musician with a PA system that is overkill for the purpose. You also get some great surprises and a display of talent that might otherwise still be in the closet. 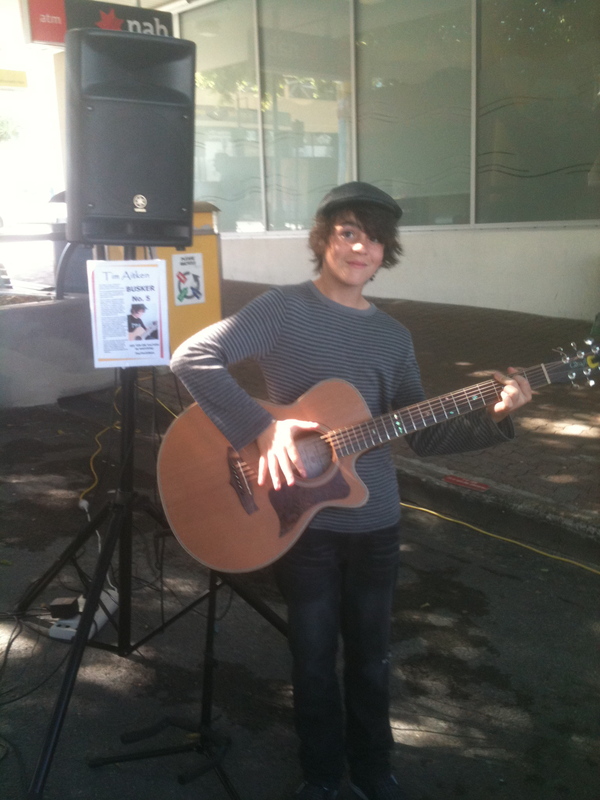 And that was the experience of first time busker Tim Aitken who won the junior section prize of $500 and a spot on the CMF stage. The four piece band Afterglow from Mooloolaba won the open section prize of $1000 and some paid market gigs. The open section entry fee was $20 and rules and guidelines, voting forms, pens and a laminated busker number all displaying sponsorship logos were included in the kit handed to buskers at the registration point. Determination of the best buskers was by public vote. This entailed each busker displaying their number and handing out the nicely printed voting form to their audience. The buskers number was to be written on the voting form and then dropped in boxes at businesses who were supporting the competition. Handing out of forms was supposed to occur only during the 2 x 40 minute performances. This year there was no provision for judging by panel or independant adjudicator . Obviously this meant that a true talent could be overcome by a lesser act if they did’nt have someone or as proved to be the case a number of people handing out and collecting the voting forms. Or if their performance slot was at time or place providing little audience opportunity. There were comments made from some buskers about the competition guidelines regarding power supply for amplification and the allocation of their 2 x 40 minute time slots. And I can understand their point of view as both winners enjoyed maximum exposure by having their final performances allocated during a crowded Sunday morning market. In their final 40 minute set both winners enjoyed a shaded area with space for people to sit and enjoy their performance. Other performers were not so lucky if their 40 minute allocations were at a time or designated spot that was out in the hot sun or bereft of audience. This was the case for a great horn player who was playing in Bulcock Street late on Friday afternoon. With little interest from anyone the sound of this guys great trumpet playing filled the street. When I asked him for a voting form he seemed surprised, when I dropped a few bucks in his case he smiled and thanked me. When I asked about his music he spoke with passion about his instrument and the school orchestra of which he was a member. Over the three days of the event I spoke with and filmed at least half of the contestants. Some quickly and unabashedly devulged their ambition to become famous rock stars, others were open about their need for the cash and some were not even sure why they had entered. One guy ( and I was a little perplexed by his lack of originality ) even copied my one man band act and called himself Captain Cambo. The busker I most enjoyed however was my friend Jordan who stood in the sun and sang the tunes I hear filtering down Mooloolaba Esplanade most Friday & Saturday evenings. Jordy is a real street performer. I also enjoyed the belly dancing of Zahrina and the Nomads with their blend of Arabic / Australian music. I was fortunate in my own allocation of performance times. The first of which was to play in the Friday market on the Boardwalk. The financial result was $53 dollars in coins and 6 of my new ” Tales of a Drifter ” CDs sold. My second performance was near the middle of the Sunday market and was one of the last performances of the competition. Again I sold some CDs and made around $50. Caloundra’s Bulcock Street is a spot I really enjoy busking, and I was lucky to be relaxing in the shade of the big fig tree which some folks say the council will be removing sometime soon. Compared to other busking competitions I have entered the experience of participating in The Bulcock Busking Festival was pretty relaxed . In future blog posts I will bring detail to subjects like busking ettiquette, acoustic values of public space, life on the road and some hilarious busking experiences. Thankyou folks for voting and for buying my CDs, the life of a busker is described in my song ” One Man Band “.